Quite a selection on recycling and renewables. Theses movements have some striking parallels. It’s easy to be critical of current widespread practices and overly optimistic about “new” approaches and technologies. Moreso for younger and less experienced people. Throw in virtue signaling and honest but misguided efforts at altruism and responsibility and much of the motivation behind the “green” push in these areas is better understood. Problems with today’s technologies have been magnified and the capabilities of alternatives have been oversold in these areas. One small example is that recycling was often promoted by touting benefits of reducing needed landfill spaces which supposedly we were running out of. Now supposedly we have plenty space for alternative energy although in reality to seriously increase wind and solar requires multiple orders of magnitude more land than conceivably could be needed for foreseeable waste landfill purposes. Thanks! Right now I am enjoying goofing off immensely and I don’t know where to even begin with the Green New Deal. But I am thinking of a summary piece of some sort. Thanks for your more continuous and diligent efforts at promoting a reasonable approach to climate and energy policy. I don’t think there’s any point in addressing the GND, it’s rather absurd. But it would be good to consider what might be a good path forward for developing an anti-fragile energy policy. I would think there is some reasonable amount of “renewables” we could tolerated expanding to/subsidizing in the interest of energy security (conserving natural gas, diversity of supply). We should develop the capability to expand if desired. I think creating excess capacity and storage of NG with large variability of production capability, and then operating at the low end would be wise. We need to be prepared for more intense winters than we’ve seen in the past 50 years. Artic blasts could be more intense than we’ve seen and last longer the 2 weeks (IIRC) we can sustain energy supplies for. It probably isn’t wise to rely on NG for heat, supply/demand variability, and base load. There does seem to be a large recycling portion here. Even the New Republic piece mentions dumpster diving.This is something of a hobby of mine. My moniker refers to my collecting beverage containers under Michigan’s ten cent bottle deposit law. I figure it fits in well with academic disputes, because, as the saying goes, “the stakes are so small”. I sometimes wonder if deposit laws might be good for other disposable items. I find lots of rechargeable batteries, which I drop off at the battery store. One thing I find impossible to get rid of is microwave oven magnetrons, which are not supposed to go in landfills because they contain beryllium. I’ve got five gallon buckets of the damn things. Lately, there’s been some concern about how huge volumes of solar panels are going to be disposed of. This new electronic age has brought us an awful lot of electronic junk that has to go somewhere. I’ve noticed that scrapyards now require electronic components to be removed from appliances before they’ll accept them. Maybe it’s time for a major reassessment of how to handle waste. Thanks for the heads up re “New insights into aerosol and climate in the Arctic” Judith. It’s of great interest to Arctic sea ice nutters like yours truly. A long list of authors and an even longer list of references! “Motivated by the need to predict how the Arctic atmosphere will change in a warming world, this article summarizes recent advances made by the research consortium NETCARE (Network on Climate and Aerosols: Addressing Key Uncertainties in Remote Canadian Environments) that contribute to our fundamental understanding of Arctic aerosol particles as they relate to climate forcing. The overall goal of NETCARE research has been to use an interdisciplinary approach encompassing extensive field observations and a range of chemical transport, earth system, and biogeochemical models. Several major findings and advances have emerged from NETCARE since its formation in 2013. Although the atmospheric mixing and aging dynamics of anthropogenic SO4 and co-emitted black carbon may be lees obvious than assumed. Thanks^2 for the heads up re the Polish Historical Arctic Database Steven! Given cost trajectories I predict a future for rooftop solar both domestically and commercially. Powering daytime air-conditioning in my comfortable corner of the world. With wind – I worry about the bats and birds. The immediate future of baseload power is gas in the distorted US market and HELE coal most everywhere else. And if coal ash is contaminating aquifers – I’d suspect poor design and construction or ash ponds. Longer term – modular nuclear seem likely to be cost competitive – and safe. …or, run the A/C during the day off the battery of a gov’t subsidized Tesla that is charged on the grid at night at reduced rates. Even if I lived in South Australia it would cost me $11,000 ($15,000 without subsidy) for a battery that would run my air-con for 1 hour. I just got an online solar quote for an 8kW solar system – nearly $10,000 for the most expensive installer. I could probably save $300 a year on aircon costs and make $700 a year in other offsets and supply to the grid. Redraw $10,000 from my 5.95% fixed interest (established long ago) fully offset mortgage – and it is very doable. Grid balance is via regional gas turbines and baseload is provided by local coal. The last of the subcritical pulverized fuel plants producing about 0.83 tonnes CO2-e/MWh-net. Low cost and still pretty good efficiency. Greenland is getting more rain..
Is there a particular reason the study period ended 7 years ago? It likely was not producing results that were sufficiently alarmist so the money stopped coming. Still hoping for the Happer Committee. Now your straying into my “professional” area of expertise David! How does “Battery trickery by U.S. utilities” == “Batteries cannot backup renewables”? Easy, Jim. The cost of the batteries actually required to backup intermittency is impossibly huge, so pretending that is what you are doing is purely deceptive. I have a study on this coming out soon. Smoothing out the “duck curve” shouldn’t cost the Earth. Bung in a bit of “low carbon” nuclear generation and what’s the problem? Surely you must know the drill? Lots of references to peer reviewed studies in reputable journals please! Keeping the lights on requires handling the likely worst case. Most places in the US are subject to prolonged high pressure systems where there is pretty much no wind power for a week, while electricity demand is near peak due to heat or cold waves. Backing up (that is, replacing) a 1000 MW wind farm for 7 days is a lot of MWh. At today’s prices the batteries would cost over 100 times as much as the wind farm. Using nukes as peaking plants would indeed be much cheaper than batteries. That is my point actually, that batteries are impossibly expensive. That the peak demand condition is often a low wind condition is a case that I have not seen treated in the literature, which is why I am studying it. If there are references to this case I would love to see them as it might save me some time. Vehicle-to-Grid technology will ultimately offer vast quantities of battery storage “free of charge”? Please excuse the poor pun! N.B. I’m back on Twitter from a different browser on a different computer. Thanks Jim, but I am looking simply at renewables with today’s battery backup technology, not possible worlds that are far from today, like total EV with distributed in-vehicle storage. Note that going EV on a grand scale also requires vastly more electricity than today, so vastly more storage would be required. None of this vastness is free. EV based storage is an interesting case, one of many grand schemes, but not what I am looking at for now. The question I am working on is what it would cost at today’s prices to do 100% wind and solar with battery backup. It is a relatively simple question. And there was me hoping you’d supply me with a link to a learned paper in a reputable journal in return! Do you know of one that forecasts static or rising prices for batteries over the next few years and decades for example? FYI I’m based in the once United Kingdom rather than the US. Were you aware that UK plc is currently spending tens of millions of once Great British Pounds on priming the pump for V2G technology? What do you think of the rain events in Greenland? The article says that that uses of the graph are misleading because “versions of the graph have excluded the modern observational temperature record”. Wrong. It would be misleading if they did splice on the modern observational record, because its resolution is different to that of the cores. If they did splice on the modern observational record, they would likely be repeating one of Michael Mann’s disgraceful corruptions in the “Hockey-Stick”. Short Lived Climate Pollution. We have already climate deniers, now another scarecrow in a form of “climate pollution” is being introduced. Holy Climate can bear just anything. These “scientists” never sleep. I have little patience for computer modelers who have little insight into Earth system geophysics. 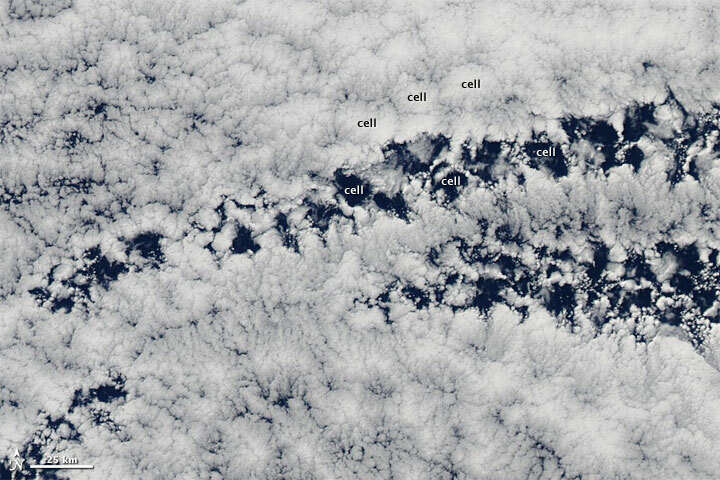 Cloud formation at the marine boundary layer occurs as closed cloud cells in Rayleigh–Bénard convection in a fluid – the atmosphere – heated from below. Mesmerizing? The difference is as closed cells in formations 1000’s of square kilometers in extent rain out from the center to leave behind open cells. 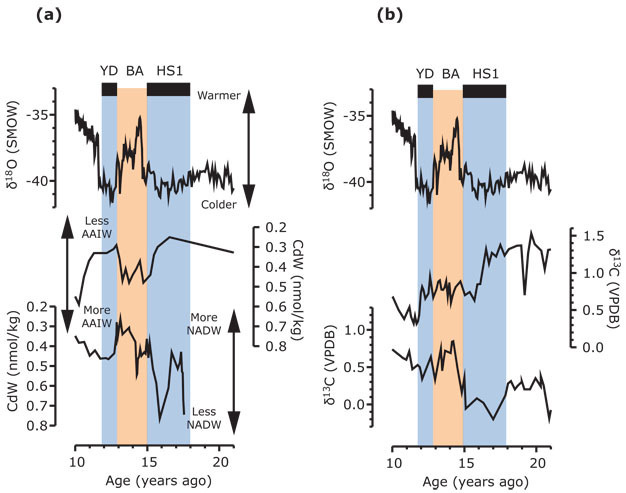 Closed cells persist for longer over cool oceans than warm with a higher domain albedo. The place where SST varies most dramatically over much of the global tropics and sub-tropics is the eastern Pacific. We have seen this modeled over centuries using historically constrained SST and large eddy simulation models. It was an observed and even dominant source of modern warming in surface and satellite data. Including post hiatus warming in CERES data. Another important aspect of cloud behaviour linked to their emergent nonlinear pattern is their longer than expected persistence due to high Lyapunov stability. They stick around longer than they should. I have read this – but who decided that the micro-physics are such that they really shouldn’t persist for that long? Besides which chaos explains nothing – if it behaves like a chaotic system then it is a chaotic system in the broad class of such systems. The physical behavior of cloud is all in the microphysics. Do you know by a chance of a simple 2-dimensional model of open or closed cells? Thanks. I meant just cloud patterns, no rain. To link is to carbon capture from air. 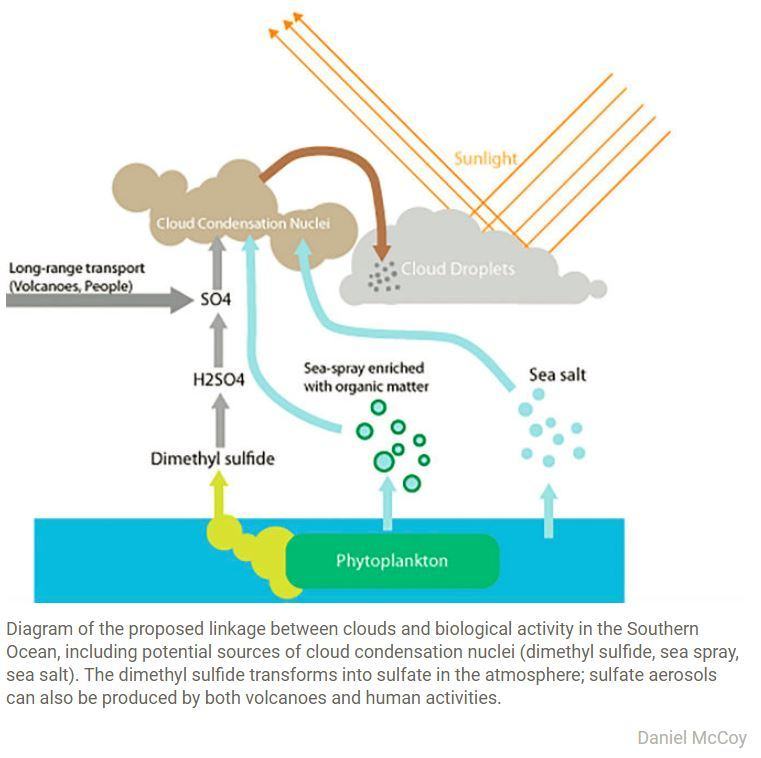 Marine stratocumulus may be unstable in a warmer atmosphere leading to a hothouse Earth. Thanks – some good reading ahead. nobody if going to school under them. Take my good friend Steve McIntrye. Who will take up his mantle? Which of his grad students will carry on, build on the masters understanding and go further? crickets. part. They built nothing. No foundations for others. no young people to come along and build on his foundation. Sad. Bob carter? where are his students? who is picking up his understanding of the climate and pushing it forward? nobody. are they laying? what classes are they teaching? what grad students are they helping? how are they pushing their theory forward? oh wait they have no theory. ( playing the “prove it” game) is the sum total of science. Its not. Thanks for the in sight: Old soldiers never die, they just fade away. To that end, remove the funding for an alternative idea, and, guess what? that idea dies; not by a thousand cuts, just that the elite, that is the elite scientists on the Governmental review boards, never provide the funding; hence, as Freeman Dyson did, they go on to something else. The lack of vociferous skepticism does not mean the ideas are not valid, only, those in control of funding are in charge, and… their prejudices prevail. Such is the life and times of Climate Science today. I’ve sat on such Governmental boards, and prejudice is the rule and not the exception. The evil is willful and deliberate, for a political agenda, and in this case, not stated, except by political types like AOC and her Green New Deal. Politics deciding science agendas is the current evil. Are you on board? I would agree with the fact that there have been people that have pretty well demonstrated real problems with (aspects of) the ‘consensus’, and that those people have not been part of academia and don’t have funding streams that pay for grad students to further their insights/lessons. The idea of ‘building something’ is not a legit gripe, IMO. Good skeptics don’t need ‘alternative theories’ to dispute ‘consensus’ claims, they just need to be able to soundly dispute whatever claims they are arguing against at a particular time. Take Nic Lewis, for example. And yes, its depressing to me that eventually we’ll lose McIntyre’s expertise (and Nic also, in a different sub-area), but almost certainly there will be folks to fill in those voids and/or different voids as time marches on. Smart people abound and free, critical thinking will continue. Well the problem here is higher education which is in deep trouble. There is in my field a deep lack of understanding of uncertainty and a deep faith based approach toward models. This is all about the soft money culture at research universities and the constant need to sell your work and bring in contracts. It’s also about postmodernism and its influence on the academy. Even science students are exposed to a lot of this nonsense. Everyone now seems to know that there is a problem and no-one is willing to do anything to correct the problem. Climate scientists are among the worst because any admission of errors or high uncertainties is a violation of the consensus code. Sorry, SM but in the final analysis nature will be the determinint regardless of what skeptics do. In 50 years, when Manhattan still isn’t underwater and the coastal mansions still aren’t threatened and Antarctica still is inherently unstable and the threat in a millennium is still a millennium away and the Arctic Sea Ice has recovered and started to trend down again and the only noticeable changes in temperatures are on graphs, won’t matter what the skeptics did or didn’t do. Those future generations will look at all the failed predictions and say what the hell were those alarmist idiots thinking. History will not judge kindly. Steven Mosher: yup. and skeptics are old and dying and most importantly nobody if going to school under them. You wrote an interesting comment. I would be interested in what you see when you view developments from the perspective of India and China, or try to. On present trends, I see them as being “left” as the civilization in the US and EU powers down. Their populations are “aging” and their economic growth may have slowed, but they aren’t doing much to reduce their CO2 emissions. California may be unusual in the rate at which employers are moving to other states, but we don’t yet rank down with Venezuela. But those are perhaps different stories. Science has always warned against simple and easy assumptions about the complex dynamical Earth system. But then there are always those who resist – or are incapable of – a change of perspective. Remember Bjorn Stevens, the good guy, and his missing Iris effect? … The convection-permitting simulations also suggest that cloud feedbacks, as arising when perturbing the equilibrium state, may be very different, and in our case less negative, than what emerges from general circulation models. This demand for some sort of better skeptical science is a weird conceit. Paul Ehrlich’s book didn’t become wrong because his skeptics retasked academia, industry and government to intensely review his masterful insights. The world did exactly what it should have with the book- ignored it and moved on. The trouble with politicized science is that it tends to make sharp minds irrelevant. For example, it’s a waste of resources to dedicate our best young minds to the job of trying to heat Chicago in negative 20 F temperatures with snow-covered solar panels. The only reason we’re doing it is because aging activists can’t give up nonsense from the ’60s. I think it could be argued that part of Pat Michaels’ legacy is Alex Epstein. Also, Steve McIntyre and Nick Lewis have shown that science does not have to come from the scientific, academic establishment. Science confirms what he regards as skeptical arguments. Some people just can’t move on. 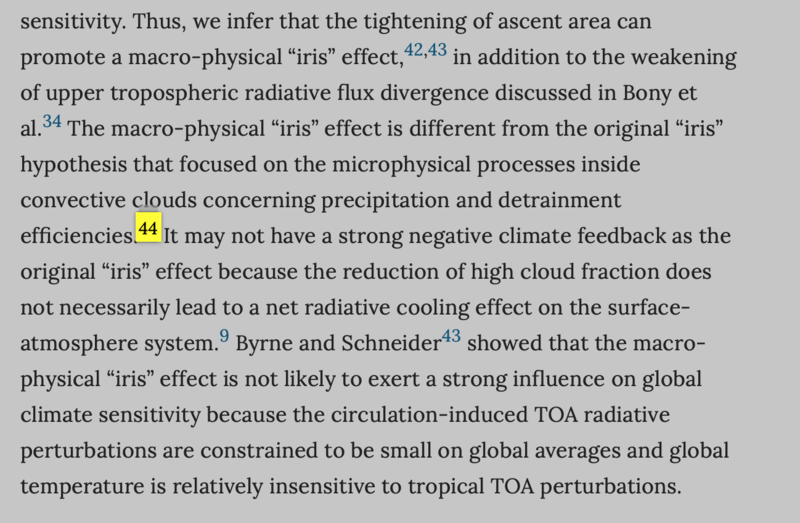 Lower domain albedo over warmer oceans than cooler – from changes in marine strato-cumulus cloud – is seen in higher IR emissions and decreased SW reflection. For those who can’t walk and chew gum at the same tome. We find that such feedback is too weak in current models, which implies stronger than expected future latent warming and possibly higher climate sensitivity. I might be willing to pay a lot more than that to fund lawsuits to stop the efforts to reduce the CO2 that helps grow or feed everything I eat. Irrelevant. The skeptics that matter are not those who are outspoken and then become the untermenschen shunned by the media and academia, your MacIntyre, Watts, Spencer, Lindzen, Soon etc. No – the ones that matter are the career scientists who genuflect to global warming to stay in work but keep their opinions to themselves, and every month publish papers in mainstream journals – not peripheral skeptic channels – with research that totally destroys the narrative of climate catastrophism. Note I say catastrophism – lets not be taken in by the conjuring trick of simply pointing out recent mild warming and implying that this of itself is a portent of catastrophe, it is not. Websites such as Climate Etc., NoTricksZone, CO2 Science and others, and journals such as Nature and many others, continually publish papers that undermine the catastrophe narrative. The alarmist position depends on the false catastrophe narrative, not just recognition of mild and generally beneficial warming / CO2 fertilization. And 57% are willing to spend $1 per month. In the end the best understanding left standing wins. Mosher overlooks the fact that the best understanding is provided not by trumpet-blowing bloggers, such as McIntyre, Watts, or himself, but by geophysicists, oceanographers, meteorologists, system and signal analysts etc. working without fanfare in their own areas of expertise. It’s they who are forcing the ever-widening recognition of the very flimsy conceptual foundations of a “climate science,” wherein CO2-controlled radiative transfer is claimed to overshadow moist convection in surface-to-atmosphere heat transfer, “positive feedbacks” are posited without any credible source of power, historical temperature variations are assumed to be “red noise” instead of more structured stochastic processes, and linear trends over several decades are blindly projected over secular time-scales. Just as the leap from alchemy to quantum mechanics was not made in one step, so the formulation of far-more-rigorous foundations for the study of climate will require many intermediate steps. Indispensably, the first step will always be, however, the rejection of pitifully inadequate, politically-favored paradigms. He quotes the reference back to me. The point was internal variability in addition to global warming. The result is robust – and the question is where the Pacific goes next? Skeptcs. … They built nothing. Steven, many of us tried. I tried to get establishment scientists to write joint papers, got nothing but quick brush offs and comments in Climategate like ‘ Fortunately, our (Aussie) sceptics are rather stupid’ or words like that. I presented technical reports to our BOM and was told that the BOM could not consider material that was not peer reviewed and publshed. One of the BOM chiefs announced he would be gatekeeper for all my emails. Why did I not go it alone? Two good reasons. First, they had raw data, a charter, funds and supercomputers, I had a hobby and an old PC. Second, most of my career I was the ideas person, the lateral thinker, the odd job problem solver, in a team with stellar performance, so I was not used to playing with the nuts and bolts that juniors used. It was not my lack of ideas, effort, willingness to cooperate that killed it. Ditto for a number of colleagues who tried like I did. What do we get for our $1 per month? Thierry Baudet doesn’t look that old to me. Could be the start of a new skeptical wave in Europe. I am looking for a markup of trenberth diagram that shows the fluxes after a CO2 doubling consistent with alarmist models. Thanks in advance ofr any pointers or ideas. Thank you for sharing the author’s professional content. Meteorology is really a wonderful thing. Start by doing an image search on “Earth’s radiation budget”. You’ll find a couple of Trenberth-type charts that show the variation of the numbers depending on whose study. From there look at “CO2 forcing” and do a couple of Modtran runs on UChicago. Then write your own blog comment about how imprortant or unimportant CO2 is relative to published discrepancies.. Hint: be wary of both wolves, and big bad wolf stories. Skeptics don’t need to train scientists, new skeptics will organically convert from the “consensus”. What happens is people see mistakes and change their minds. For example, the 100% renewable people will try to build such a system and it will fail and be studied and some scientists will start to speak out that 100% renewable won’t work (with our current technology). People will learn a lot from Germany and Australia. Maybe if we invent a practical fusion power source, or invent space based solar (the trick is getting the power down to the ground). But alas, we haven’t invented a way out yet. We haven’t even invented a good power storage technology which will provide stored power to a large city for several days. Eventually, through trial and error, we will grow up and realize we have to deploy nuclear power. I see a future with 75% nuclear, 25% renewable and still using some fossil fuels for things like making steel (oops – more than 100%). But until we grow up and get over the irrational fear of nuclear power, we will simply burn more and more fossil fuels (until and if we run out). Just a lay person’s opinion. Models that rely only upon radiative transfer will never produce realistic results for an aqueous planet. Hint: examine evaporation and moist convection, which constitute the principal means of surface heat transfer on Earth. Europe is all in a tizzy over using chopped down trees to burn for renewable energy. China is no longer buying recycled paper and plastic. Might there be some dots to connect here? Current consumption patterns generate low grade recycling waste streams? ie. single serving packaging made from thousands of different chemical compounds. 1/3 of my groceries actually have 2 containers, one for handling and labeling and another for sanitary product preservation. Looks like the easy fix is to just (safely) bury everything and let the future sort it out. less material and resources are used to produce the single serving plastic packaging than any reasonable replacement. If it is not worth keeping and recycling here, the Chinese figure out that it is not worth doing it for us. Recycling stuff that should not be recycled is reaching the end of the scam. The 3rd law of thermodynamics states that entropy of crystalline substances approaches zero as temperature approaches absolute zero. For non-crystalline substances, entropy approaches a fixed non-zero value as temperature approaches absolute zero. Since zero entropy and zero temperature are lower limits, both are unattainable in a finite number of steps. It would take infinite number of steps to attain them. Hence, they are deemed impossible. Quantum mechanics was developed after the 3rd law so Nernst did not use it in his formulation of the law. Neither did he use statistical mechanics, which was known at that time. I will explain the 3rd law using quantum mechanics and statistical mechanics because it is easier and more accurate than classical thermodynamics. It is easy to see why zero entropy is deemed impossible. In statistical mechanics, the Boltzmann entropy is proportional to the number of possible microstates corresponding to a macrostate. The only way to get zero entropy is the number of microstates must be one. In quantum mechanics, Pauli’s exclusion principle states that fermions cannot have the same four quantum numbers. Fermions are particles with non-integer spin. Hence, if there is more than one fermion, there are at least two microstates representing the different quantum numbers (two fermions cannot have the same four quantum numbers). Therefore, they cannot have zero entropy because the number of microstates is at least two. Bosons are particles with integer spin. They do not obey the exclusion principle. Hence, they can have the same four quantum numbers. As I explained, the exclusion principle is the reason why zero entropy is impossible. Without the restriction imposed by the exclusion principle, zero entropy is possible. Bose-Einstein condensates (BEC) are bosons under special condition near absolute zero temperature. I postulate that BEC has zero entropy. I will give a mathematical proof of this postulate. Since it violates the 3rd law of thermodynamics, the proof of the postulate is a disproof of the 3rd law. What does infinite probability mean? P = 1 means certainty that a particle occupies energy level E. In discrete probability, an integer P > 1 means more than one particle can occupy the energy level. The first factor is less than 1 because the total number of bosons (N) is greater than 1. The second factor equals infinity because the denominator is zero. However, division by zero is undefined in math. To observe proper mathematical rules, the degeneracy of energy level (g) must be infinite to equal infinity and to eliminate the zero divisor. Degeneracy is the number of microstates or particles that can occupy one energy level. This is the same as the interpretation in discrete probability. This means all the particles in BEC are in one energy level which is the ground state. No matter how many particles, there is only one microstate. I used the symbols W, E and N to represent the same symbols used in statistical mechanics that are analogous to probability theory. Therefore, the entropy of BEC is zero. This proves my postulate and disproves the 3rd law of thermodynamics. Zero entropy can be understood using group theory, the study of mathematical symmetries. When objects undergo change, what remain the same are symmetries. Objects are highly symmetrical if they retain many of their features after undergoing change. The bosons in BEC are analogous to indistinguishable objects. No matter how you rearrange them, they look the same. They are just one permutation. They are perfectly symmetrical. Entropy is a measure of disorder. BEC bosons are in perfect order. Therefore, their disorder (entropy) is zero. My postulate is not just theoretical. The existence of BEC has been confirmed experimentally. Cornell and Wieman produced BEC in the lab by cooling 2,000 Rubidium-87 atoms to 170 nanoKelvins (billionth of a degree above absolute zero). For this discovery, they won the 2001 Nobel Prize in Physics. Next I will reformulate the 3rd law of thermodynamics to conform with quantum statistical mechanics. The recent reference to rain triggering more melting on the Greenland ice sheet states a potential global average sea rise of 7 metres. No time scale was mentioned but as is usual alarmist press reports follow with pictures of Armageddon showing the Statue of Liberty, Big Ben and the Eifel Tower under water. where y is the sea level and t is the time such that 1800 is set at zero. As an aside polynomial curve fitting is a useful tool but must be used with respect. Some physical background is helpful such as in this case a “constant driving force”, whatever that is, is creating a constant acceleration which in this case is 0.0126 mm/year/year. Any subsequent extrapolation must be accompanied with a Public Health Warning and treated with due respect. These reservations regarding curve fitting/extrapolation are very applicable to the studies of the 25 years of NASA readings but that’s another story. Back to the above equation, and after taking a deep breath, lets calculate values over the next 1000 years or so. In 1880 the level was about -150mm with a slope of about 0.8mm/year. The current values are about 70mm and 2.5mm/year. By 2100 they reach 320mm and 3.5mm/year and by 2900 have just reached 7000mm (7metres) and a slope of still only 13.5mm/year. I say “still only” as post the last ice age the average slope was about 15mm/year for about 8000 years. This high post ice age rate must have been because of all the goats being reared and clay pots being fired! The above is not to be taken as a definitive study but used to illustrate the order of times etc that may be taking place. The following résumé is of my, as yet unpublished, paper entitled “Accelerating Sea Level Rise – Reconciliation of Tidal Gauge Readings with Satellite Data”. It summarises an investigation into the two large sources of historic sea levels, namely Tidal Gauge and NASA Satellite databases. The summary of this paper, reproduced below, shows what was covered and the two graphs below are copies of Figures 8 and 22 from the paper with added explanatory annotation. (These comments are my first venture in submitting to this site and I am not sure if the 2 diagrams will appear correctly, or at all. I have conveyed them to JC (as Appendices 2 and 3 to my paper} and would be grateful, assuming they are absent, if there any way they could be shown. was derived, where t is now defined as 1800 being t=0. See figure 8 and Appendix 2. This equation was then used for short and long-term projections. During this study other possible formulae to replace the constant acceleration were also investigated. See figure 22 and Appendix 3. Short term projections were carried out. 1. Reduction of slope down to about 2mm/year by 2030. 2. Slope reaching 3.7mm/year around 2060. 3. Sea level about 250mm above 2018 levels by 2100. It can also be concluded that the basic Quadratic Curve, being based on a nearly 140-year period, is probably a true indication of the process taking place and the limited extrapolation to 2100 is more acceptable than any based on the 25-year NASA Satellite readings. The Quadratic points to a constant acceleration, which in turn points to a constant “Driving Force” what ever that is, but to remain constant over such a long period of 140 years points, in my mind, to a mainly natural cause. The combined curve shows a better fit at each end than the equivalent quadratic fit. The latter would extrapolate to much higher values by 2100. The post 2018 extrapolation points to a reduction of the slope over the next 10 years but any further extrapolation is judged questionable at this stage as the long-term findings of the Tidal Gauges must also be taken in to account. Each combined curve contains a sinusoidal element that may be the result of the methods used in obtaining the readings. The Tidal Gauge readings have a sparse coverage and would be affected by the known “60 Year” Oscillation. Allowing for all the various ocean amplitudes and phase differences could easily result in the +/-6mm perceived oscillation. The NASA readings do not have a 100% coverage and known 20 to 30-year ocean oscillations, such as the PDO, could easily lead to a +/-3.5mm added variation. The main conclusions are that the Tidal Gauge results are a good indication of the changes in sea level. The additional sinusoidal variations are consequences of the method of measurement and coverage. This all points to a possible additional 250mm rise by 2100. If anyone is interested in viewing my paper, I can be contacted on alankwelch@gmail.com. Hello Alan, this looks very interesting. I will email you to request a copy. alankwelch: The main conclusions are that the Tidal Gauge results are a good indication of the changes in sea level. The additional sinusoidal variations are consequences of the method of measurement and coverage. This all points to a possible additional 250mm rise by 2100. That was a good post. Thank you. I appreciate your warnings about extrapolating polynomial fits. Would you consider posting your paper at ResearchGate? Please let us know when it gets published. Put your paper in Arxiv. The 60-yr oscillation in sea level rise is well known thanks to Jevrejeva’s group studies, particularly her 2008 article. BY 2100 we will have enough cheap nuclear power to control sea level and melt the next ice age. Problem solved! Dr. Strangelove comments about Bosons at zero temperature do not apply to physical systems like liquid Helium at zero temperature. Here the particles are strongly interacting and the free-particle Bose distribution does not apply. But looking at such systems with more powerful method shows that their entropy still vanishes. Yes Helium-4 is liquid and can form BEC. My example is Rubidium-87 which is gas and BEC. By the way, zero entropy is possible below critical temperature but zero temperature is not possible because virtual particles interact with bosons so their kinetic energy is never zero. And kinetic temperature is the kinetic energy of particles. The Republicans have failed us on the issue of nuclear power. They cower before the Green blob. Scientists have failed us. They cower too. Fear and ignorance won. If we have to virtue signal, do it for the right thing, Nuclear Power. How about $500 million a year subsidies to keep old nuclear plants running? I’m in support of this subsidy but I would require the utility companies to reinvest the money rather than just make them more profitable. Being a newcomer to this site my first submission (March 12th) was marred by the absence of 2 important figures which encapsulated the main content of my comments. I had produced a Word document, which had the figures embedded within, and cut and pasted this document into the comments box. The text appeared but no diagrams. How does one submit a comment with diagrams embedded? Any advice on this would help me and hopefully other contributors. It should work if you make any picture a jpg or png. Don’t include sizing information in the filename. Another question on Trenberth diagram. I would expect earth average IR up to be the stefan -boltzman blackbody value less a few percent. Trenberth shows a higher number (like 396 Wm-2) that yields 17C average temp, instead of 14C. Is trenberth meant to be after a CO2 doubling? Another amazing set of reference links. One item that caught my eye was the Boeing AI failure that has grounded its planes. This may seem oblique to climate issues, but it has direct relevance to the “alternative energy” world. If one reads how the imagined pulsing of solar and wind at scale is assumed to be managed over millions of local generation and use sites, it involves the same kind of “artificial intelligence” software that Boeing is using to “avoid human error”. When one shifts the grid from a few hundred steady-source generation units, to a few hundred million small distributed generation/consumption points, and IF one seeks to manage this pulsing mass as a common utility, then the issues of AI limits appear. …notice the current patterns of electricity use without millions of distributed EV batteries at the edges of the grid. Base load versus peaker generators over daily 24 hour cycles. If 1.5 billion EVs seek to “use the void” of electricity distribution at night, then there will be massive changes in both the physical and economic dimensions of electricity distribution. Linear extrapolations of the past into the future always mask unintended consequences. Plus the mining and scrap of billions of tons of matter in the battery life cycle makes current global e-waste flows look benign. Good point. I believe the smart grid technology also makes us more vulnerable to malicious actors. It should make us better handle weather and natural disasters, but software becomes vulnerable to attack. Per the article on biofuels. I was in the room when the ethanol subsidies were built. The current system was proposed years ago coincident with the Corporate Average Fuel Economy (CAFE) regulations. It was clear at the time that this would be a terrible environmenal “solution” – simply owing to the diversion of scarce water to automotive and agricutural transportation. If you follow the entire network that emerged from this political boondoggle, it will reveal how absurd the policy is. Start with agricultural water cycles, go through the changes in automotive components (mostly the fossil chemical plastic and rubber seals), distribution systems, loss of energy density in final use, insecticide/fertilizer in ground water – and so on. At that time Americans were driving between 1-2 trillion miles per year, so the net assumed benefits of the ethanol subsidies could have been met with simple reductions in the growth of driving. Today Americans are driving about 3 trillion miles per year, so small reductions in driving are more environmentally effective than the planned targets of more than 50 million electric vehicles in the US – or 1.5 billion worldwide. Total life cycles determine which enviromental solutions are truly valuable. Myopic regulators and politicians shoot first…and then shoot again later…still without aiming. I wasn’t exactly in the room, but was city head of traffic when the ethanol boom started in Brazil. The aim at the time was to find a substitute for sugar and thus save the big sugar plantations and refineries. After adding 8% of anhydride ethanol to gas, it was found that gas could be unleaded without octane loss. Claro, this was touted as “environmkental friendly” and is a huge benefit, but really was an afterthought. Soyabean cake is a major export which means that oil is pressed out before transport. The Gov found out that trucks were filling up and running on soya oil (which plays hell with the engine, but works). And not paying taxes. Hence “Biodiesel” was born and added to local diesel (in short supply) or even as 100% Bio Fuel for city buses. In the latter, the oil (with less tax) is refined and does have a zero sulphur content as well as lower particle emissions. The market for oil both domestic and worldwide does not compensate transport costs. Wind is harvested in the NE of Brazil – not so much a greeny fob, but makes use of the stiff trade wind to meet a fair % of demand and reduce the use of hydro power (necessary in a drought striken zone). The raw material of monetary growth in the West during the 16th to 19th C was silver from Potosí (Rich Mountain – Cerro Rico) in Bolivia. This is also the country with the largest reserves of Lithium. Recycling EV batteries is one thing, the scramble for the raw material will be a different aspect to keep an eye on. but zero temperature is not possible because virtual particles interact with bosons so their kinetic energy is never zero. And kinetic temperature is the kinetic energy of particles. This is not correct. For example, He atoms have repulsive forces between each other — I suppose you could call this force a “virtual particle interaction”. Nevertheless, in principle liquid He can be cooled as close to T=0 as you want. Yes as close to T = 0 as you want but not T = 0. It’s the concept of limit in calculus or asymptote in analytic geometry. By the way, forces between atoms are Van der Waals forces due to electromagnetic force. Virtual particles are from vacuum energy. They are not the same. Over time in our non-equilibrium system energy out is equal to energy in – and this is maximum entropy. Robert I Ellison: Over time in our non-equilibrium system energy out is equal to energy in – and this is maximum entropy. deltaH + TdeltaS >= 0, where deltaH is energy flow (plus means into the system), and TdeltaS is the temperature weighted entropy change. On earth, energy inflow slightly exceeds energy outflow, permitting (by law, but not guaranteeing) biological processes to invest energy in reducing entropy. In absolute terms the difference may be slight, but in biological terms is is critical: creating tight structures with high energy bonds like cellulose, glucose, ATP, hemoglobin and tooth enamel. This is what makes corn nutritious; glucose to power muscles; teeth to chew leaves, meat, stems and bones; wood to burn and warm our homes in winter; and all life to proceed. 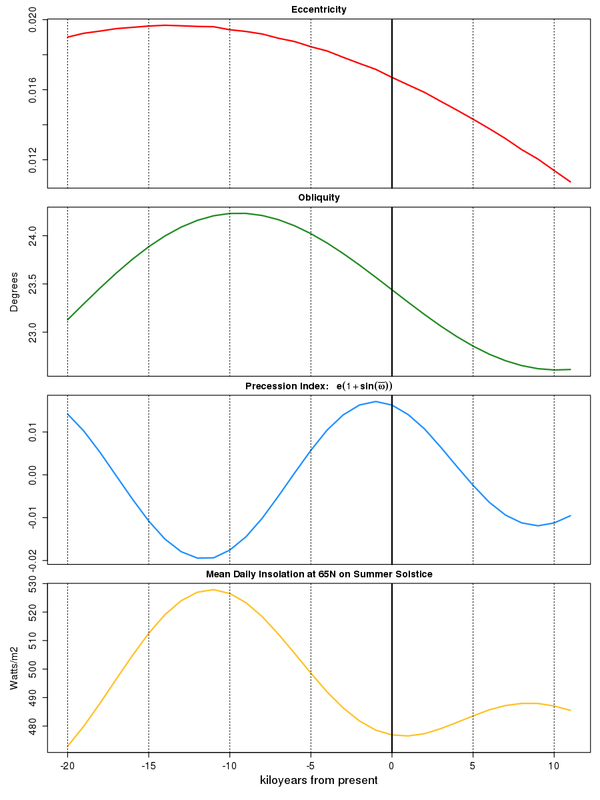 Considering the earth and sun together with the rest of the universe, entropy increases with energy transfer, but there is no reason think that it is anywhere maximum. Hence my question: What is that about? Did you, as sometimes happens to everyone including you — did you intend to write something different? It is such a crappy thesis and Matthew whines that I won’t argue it. On the basis of semantic superficiality. When does he ever do anything else? There are other more important aspects to note in my comment than warming and extinction. But I did provide the National Geographic link. Show it ain’t so – not just whine about ‘may’. I had intended to pithily indicate that there was an underlying Earth system reality. But far from a notion that life reverses entropy – there is the idea that life in its profusion from cellular proteins to herds of wildebeast take free energy and irreversibly transform it according the principle of maximum entropy production (MEP). Energy is dissipated through the physical and biological system – understood through the elegance of MEP – in states that are far from thermodynamic equilibrium. But ultimately energy in = energy out. As nearly as makes no difference. Robert I Ellison: But ultimately energy in = energy out. thanks for the clarification: ultmately. I suspected that something might be missing from your earlier post. In the meantime, the difference supports life on earth. I did say over time. The biome is relatively stable – autotrophs and heterotrophs – the circle of life. I was thinking more of deep sequestered energy in carbon-carbon bonds. Not something on which life depends. New machine learning model extend current forecast horizon from 10 days out to 6 weeks. I assume that the work is continuing as I see Microsoft is supporting the project. E3SMv1’s aerosol-related effective radiative forcing (ERFari+aci= -1.65 W m−2),equilibrium climate sensitivity (ECS = 5.3 K) and transient climate response (TCR= 2.93 K) are larger in magnitude than most CMIP5 models, but fall within previously published uncertainty bounds. Predictions of large future warming are due to unusually large positive shortwave cloud feedback. Are cloud feedbacks from natural SST variability large too? •	Don’t damage your credibility by arguing about stuff that is well established instead of focusing on the policy implications and claims that are obviously stupid. •	Better to focus on criticising the things that you can show are stupid and are wrong rather than argue about things where they respond that you are stupid and we’re not going to listen to you at all. •	Projected human caused warming this century is ~2C with 1.35C TCR and RCP6.0 (I think). •	Therefore, there is not valid justification for policies to reduce global warming. •	They are doing great harm for no benefit. •	Focus on the impacts of bad policy on the hip pocket nerve. I do, but you won’t. I’ll listen to Nic all day long. To trolls like you……………..not so much. There are better things to read. It’s a mystery how this is still a mystery to them. I’m not interested in getting into a pishing contest with you about who’s the smartest guy on the block. Beto, AOC, Bernie, Klobuchar, Kamala, Krugman, Friedman, Kerry, Obama etc. etc. are all singing out of the same ridiculously uninformed alarmist hymnal. If you are really a lukewarmer you need to spend more time educating your peeps and less time calculating average temperatures. Steven Mosher: •	Better to focus on criticising the things that you can show are stupid and are wrong rather than argue about things where they respond that you are stupid and we’re not going to listen to you at all. Here in CA the drought is over (except a couple of small places like Eastern San Diego Co., where modest drought conditions prevail); and the Sierra Nevada Snowpack is it (near) record levels. So spring will bring one of the recurrent CA episodes of great flooding (probably in the upper 5% of the flood total distribution.) Gov Newsome has cancelled most of the “bullet train to nowhere”, so now that it really goes only between two places that travellers will avoid. But CA is still avoiding investment to maintain and enhance its flood control and irrigation system. California is investing heavily in solar and wind power, even though CA could eliminate CO2 production entirely without having much effect on the global growth of CO2 in the atmosphere. Can we agree that CA policy with respect to CO2 and climate change is stupid and wrong? Are you permitting debate on whether atmosphere and surface warm at equal rates, or what the evidence says about how much warming to expect at the surface? Do you admit evidence that the co-occurring warming, rainfall increase and CO2 increase since the late 19th century have been of net benefit? An engineer, a mathematician and a philosopher walk into a bar… the bartender is a parrot and asks them what they’ll have… the joke is on us. I’d opt for not doing something economically stupid. After all that’s what they did in Paris. Commercialization of 21st century technology seems like a win win. What is uncertain is how chiseled in stone any of these forecasts are. Let’s not find out if we don’t have. 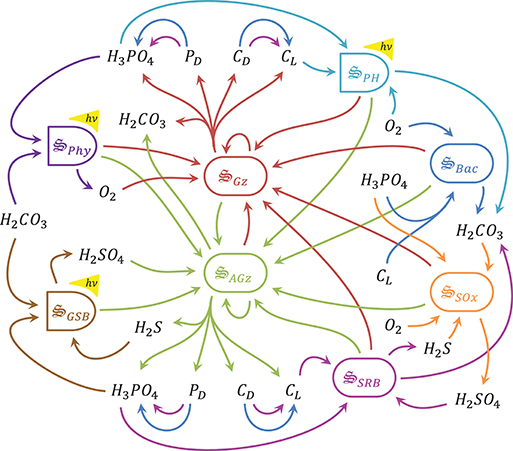 Well yes – some of these gases do have a long life cycle. Well yes – there are lots of environmental problems. Here’s my favorite video of the moment starring international treasure Rattan Lal. Much better than some old white guys sitting around a room. 3. I infer the optimum GMST for ecosystems is that which existed around the Eocene Thermal Maximum and during the Cambrian Explosion, i.e. ~28 C which is about 13 C warmer than present. 10. I infer from the above that global warming is net beneficial for ecosystems when GMST is below the optimum (which may be around 10–13 C above present GMST). I had a brief look at the links in Lang’s comment. But really I can’t argue again such reasoning motivated in service of a simplistic thesis. But not only do models miss global scale decadal variability – Nic Lewis does as well. Without which no analysis can do justice to the Earth system. Insolation may form a backdrop against which perpetual internal variability plays out. Change that by the nature of complex dynamical systems is in abruptly shifting regimes. With such a system and with a century long decline in AMOC – it seems unclear even that warming is guaranteed. But we know where we are and with 21st century knowledge and technology – we can build both agricultural productivity and restore and conserve ecosystems. “May” is an important word in that quote. Is there relevant evidence regarding extinctions due to warming at temps lower than Peter Lang’s hypothesized. In fact, there isn’t evidence that Peter Lang is wrong in any of his assertions, is there? Surely you’d have told us if you found any. Placed with wrong MM comment. With Ethanol And Biomass No Longer Viewed As “Green,” Will Other Renewables Soon Follow? We are winning. Keep on the economics. Let the believers take their own path. Stay on the smart path. If you have to burn it, it ain’t Green. To your comment on economics I would point out my electricity usage dropped by over 60% after I switched to zoned heating and cooling and put my electric water heater on a smart timer. The “green wave” of utilities shutting down coal fired power plants in the name of climate change has hit a rock, with bigger rocks to come. In this case the rock is the activist Burn More Coal, with the help of the US Securities and Exchange Commission (SEC). The big rocks to come are shareholder meetings of the monster utilities Duke Energy and Exelon, plus many more as well. As we explained three months ago, Burn More Coal (BMC) is filing proposed stockholder motions calling on the green wave utilities to account for their lavishly expensive carbon cutting plans, given that there is no regulatory requirement to make these cuts. Their first hits were on Duke and Exelon. Not surprisingly, the utilities resisted in writing, so these twin issues went to the SEC for adjudication, along with BMC’s responses. Now the SEC has ruled in BMC’s favor, so the motions will go to the stockholders for a vote. The entire correspondence is available here. It is a fun read indeed. There is also a Supporting Statement specifying what is to be reported. These two SEC rulings are a clear precedent that the Burn More Coal motions cannot be blocked. On to the stockholder meetings! Should be great fun. It has been long held that the Norwegian Sea is where the key downwelling and cold deep water formation occurs that drives the AMOC. That’s what I was taught in my oceanography degree in Southampton in the early 1980’s. More recently this was contradicted and the “consensus” moved to modelling studies suggesting that the Labrador Sea was more important. (An America-centric view.) But in the last year or two research covered here at Climate Etc. reaffirmed that it is indeed the Norwegian Sea after all, not the Labrador Sea, that is the key site of AMOC cold water formation. In this context it is not at all surprising to find that, if you bottle up the Norwegian Sea with ice cover, the AMOC will be abruptly slowed down, and since the AMOC is probably the most important driver of NH climate, an abrupt climate shift is highly likely to follow from either covering or uncovering of the Norwegian Sea with Sea ice. which increased the resistance of the Antarctic upper water column to orbitally paced drivers of carbon dioxide release. So talebanically fanatical is climate dogma now, that nothing, but nothing, affects climate except via CO2. CO2 does not increase until after glacial termination is well underway, but this is no problem for the faithful. Did you know BTW that having red spots all over your skin can cause measles? Better take that vaccine. Unless you’re an anti-vaxer who believes that only CO2 causes measles. The emergence of the 100,000-year cycle coincided with a reduction in deep-water supply and a freshening of the surface ocean. So, if cold meltwater from Antarctica fails to downwell and hangs around at the surface, freshening it, that causes cooling and less frequent interglacials. But that’s odd – because when freshening is detected in the 21st century around either Antarctica or Greenland, we’re told that this is due to accelerating melt from warming. So surface freshening around ice masses can cause either warming or cooling, as required in context. Excerpts from the article: As our children skip school to chant climate alarmist slogans, you may wonder “Where do they get this stuff?” Of course they get some of it from their teachers, but these teachers get a lot of it via the U.S. Federal Government. The sad fact is that a number of federal agencies either maintain or fund websites that specifically exist to push alarmist teaching materials. 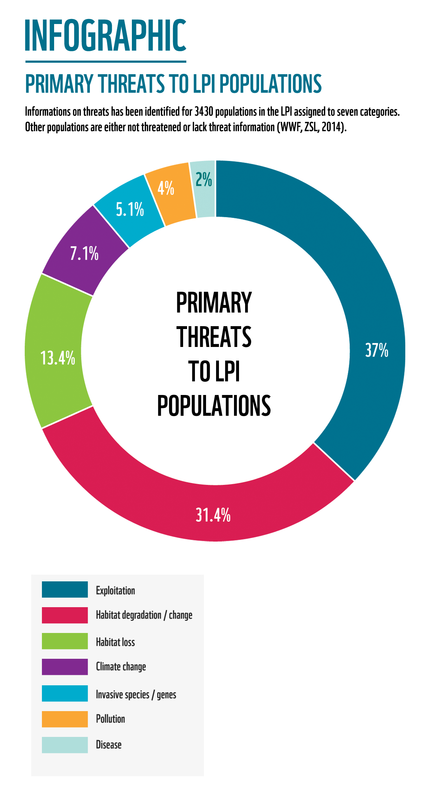 In many cases these alarmist materials are also federally funded. The Trump Administration has done very little to stem this flow of propaganda to our children. The lack of a skeptical education website supports the illusion of alarmist consensus.